Recently I had an information exchange with someone who was very familiar with how the Verizon system computes the distance between a cell tower and a cell phone. It was very enlightening and has important implications for further searching for Bill Ewasko. What I was told is that a Verizon cell tower sends out timing pulses to all phones currently connected to that tower. Upon receiving the tower pulse, each phone sends a pulse back. Based upon the time interval between when a pulse is sent out and when it comes back (at the speed of light), a tower computes the distance. Actually, what the tower does is compute a “path length” to the phone, and this distinction will become important shortly. In the case of Ewasko, the Verizon technician reported the distance (actually path length) to be 10.6 miles, within 10%. Roughly speaking, this would translate to a path length from 10 miles to 11.2 miles. The first implication to this is, assuming this info is all correct, there’s no physical way for Ewasko’s phone to have been further away from the tower than 11.2 miles when the ping was made. Since the measurement is done by timing, for the phone to be further away than 11.2 miles the signal would have had to have traveled faster than the speed of light. And Einstein says “Nein!” to that. A hard outer limit of 11.2 miles excludes a lot of area including Quail Mountain, Lang Canyon, Stubbe Springs and Juniper Flats. You can draw a line from Samuelson’s Rocks southwest along the southerly slopes of Smith Water Canyon and on southwest toward the upper Covington Flat trailhead, and that’s pretty much the outer limit. Bill has to be to the north or northwest of that line. And note that this area only starts at the very outer limits of the primary search area. This suggests Bill could have been exiting out of the search area just as things were getting into gear. OK, here’s where we get into importance of path length. At cell phone frequencies, cell phone signals can bounce a lot, especially off rock faces. And a path length, as computed by a tower, can be very different from the true distance between the phone and the tower. As an example, I’ll use an extreme case (although theoretically possible). Imagine a mine tunnel in the side of a hill right below a cell tower. A person inside the tunnel can’t see the tower above, but looking out the entrance can see a massive, rocky cliff face 5 miles away. If this person turns on their cell phone the signals between the phone and the tower above will reflect off that rock face 5 miles out. The tower’s timing pulses travel from the tower, bounce off the rock face and come back to the phone in the tunnel below the tower. The phone then responds, and its return signal follows the same path in reverse. The tower does its number crunching and comes up with a distance of 10 miles. But that’s path length. In fact the phone is right underneath the tower at a distance of 0 miles. So you can see how reflections in the actual signal path can result in a difference between the recorded path length and the actual distance between the tower and phone. When there is a line of sight between the phone and the tower, there are no reflections and the path length is equal to the actual length. So how far away can you bounce a signal off a rock face and what does it mean in this case? The short answer is that no one really seems to know how far you can bounce a signal off rock. Clearly if it’s a smooth, massive cliff thousands of feet high, like El Capitan in Yosemite Valley, the amount of reflection should be pretty good. But much of JTNP, and especially the area Bill was hiking in, lacks such large faces. Instead there are broken cliff faces and boulder piles. These would tend to scatter the cell signal rather than provide a clean mirror-like reflection. Based upon my experience in radio operations my gut reaction is a cell phone would have to be within maybe a few hundred yards of a rocky reflector to get a signal out. But let’s assume a best case and say that it’s possible to get a reflection off a rock face a full mile from the phone. What does that imply and what does it say about a minimum limit? Like my tunnel example, you get maximum discrepancy between the path length and actual distance when there’s a 180 degree reflection. 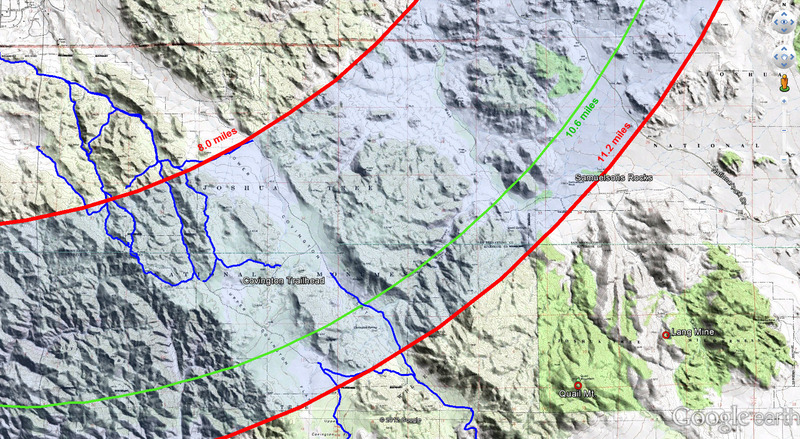 Previously I had mentioned the minimum probable path length was 10 miles. Given a rock face reflection limit of 1 mile, the “nearest case” would be for Bill’s phone to have been at 8 miles from the tower and bouncing its ping off a rock face located behind him at 9 miles from the tower. This configuration would cause the tower to compute a path length of 10 miles. This thus gives us an inner limit to Bill’s whereabouts of about 8 miles. So per this analysis, Bill’s phone would have had to have been between 8 miles and 11.2 miles of the Serin Drive tower when the single ping was received. BTW, if you use a maximum rock reflection distance of a few hundred yards, which I think is probably more realistic, the inner distance moves to around 9.5 miles. This would mean Bill’s phone was between 9.5 miles and 11.2 miles. This area, near the northerly portions of the park, hasn’t had a lot of effort put into it so far, as it seemed so improbable. However in light of this reexamination of basic data myself and my ne’er-do-well cohorts have started to hit it, as well as some other groups. So hopefully something will arise. The southerly slopes of Smith Water Canyon are also within this “sweet spot”, but those provide some substantial challenges (not to mention the friggin’ mountain lions!). Bill can’t have been farther than 11.2 miles from the Serin tower. He can’t have been closer to the tower than 8 miles (with 9.5 miles being more realistic). If there was a reflection (which seems likely at this point) Bill would have to have been in fairly close proximity to areas of terrain strongly illuminated by the Serin tower. See how easy it is? Now get out there and find him! Well, maybe wait until it’s cool at least.